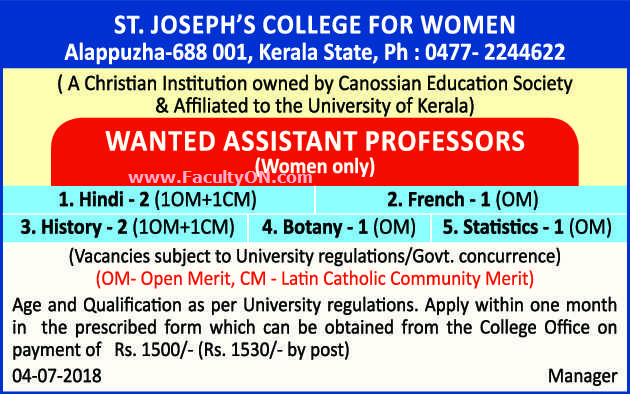 St. Joseph's College for Women, Alappuzha has advertised in THE HINDU Opportunities newspaper for the recruitment of Assistant Professor jobs vacancies. Interested and eligible job aspirants are requested to apply within 30 days from 04th July 2018. Check out further more details below. About College : St. Joseph’s College for Women caters to around 1290 students with the support of about 70 teaching staff including permanent faculty and guest faculty and 30 non-teaching staff. Among the teaching staff, about 40 % have Ph.D. and most of the rest have M. Phil. as their highest degree while several are engaged in the process of obtaining their doctorate. Several members of the staff are engaged in externally funded research projects while several have completed projects. Qualifications: As per University norms. How to Apply: Interested and eligible candidates are requested to send submit their filled-in prescribed application form along with all copies of certificates / supporting documents and recent colour PP size photos to the following postal address. Application form can be had in the college office by paying the application fee.